Great Vibes, Great Wedding – Thank you . We have arrived safely back in Dubai and just wanted to thank you once again for everything you had done for us. 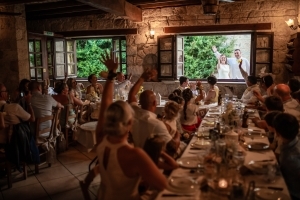 Before arriving to a country (Cyprus) i was uncertain about and getting married there, you made our decision very easy with your quick and professional responses to all my questions. I felt i could ask you anything and it wasn’t an issue for you. Giving me detailed explanations and really taking the time to care about our big day made our choice to hire you even more easier. From the hotel booking, the flowers, the venue, the transportation, the photo’s, the registration, the paperwork and so much more…..was all such a breeze for you and giving us so many choices and taking care of everything was such a dream come true. You where there every step of the way and even went above and beyond our expectations. We thank you so much for everything Stella. Our day was so special. Stress free, emotional, full of laughs and happiness.Couldn’t have done it without you. Honestly. Everything you said would happen did happen and all in a timely fashion as promised from day one. Staying at Capital Coast was also a fantastic location. Across the road to your husbands restaurant Zaffron/Koh I Noor….and what an awesome place. Good vibes, great staff, felt so welcome and not to mention the food…..yummy. 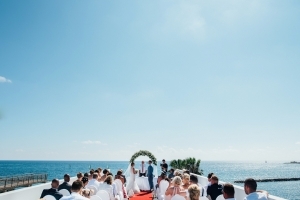 We will be recommending you to all our friends in Dubai that want to get married in Cyprus Stella. We thank you again for everything and wish you every success in the near future.